In an economic slowdown, rental properties, such as multifamily apartments, can experience vacancies1; people might move in with roommates or delay moving off their parents’ couches. When it comes to student housing, however, universities don’t shut down during recessions. Rather, statistics show recessions can actually boost enrollment. According to the United States Census Bureau, enrollment in college increased from 17.2 million students in 2006 to 20.4 million students by 2011, representing an increase of 18.6% over the course of the Great Recession.2 Economic downturns can motivate high school graduates to attend college, rather than immediately enter the workforce. Additionally, an economic downturn can encourage laid-off workers to attend classes at the local university, where they learn can new skills to make them more competitive in an evolving job market. Enrollment, rather than the overall economy, is the deciding factor when it comes to the success or failure of a student housing property. 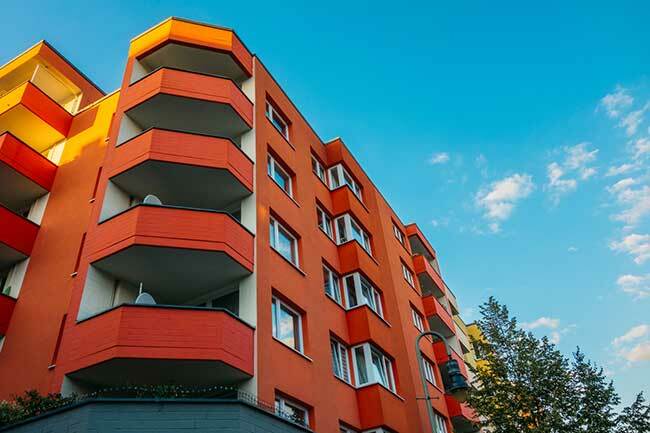 While student housing investments can offer attractive risk-adjusted returns, it’s important to understand timing, enrollment fundamentals and geography when it comes to this sector. The first thing that might come to mind when mentioning “student housing” is a sterile, blocky dormitory, or “residence hall,” in sector parlance. For the most part, that is considered “on-campus” housing, which is typically owned and/or maintained by the university, or the university in partnership with a private management company. The student housing sector has matured as an asset class in the past 20 years as new generations of students looked for more private, comfortable housing than the traditional college dormitory could provide. Developers jumped on board, creating purpose-built, highly luxurious student housing product. Gone, for the most part, are the run-down, dilapidated houses and apartments that once catered to students. Today’s brand-new properties feature granite countertops, stainless-steel appliances, walk-in closets and in-unit washers and dryers. Community amenities include large swimming pools, hot tubs, study halls and fitness centers, with Wi-Fi an absolute must. Owners of older properties are also investing capital to remain competitive with the newer product. Before taking the plunge, it’s important to consider the following. Geography. If you’re considering a direct investment or one through a DST, it’s a good idea to target housing that is as close to campus as possible, or that is served by a regular shuttle or transit service. Enrollment. An important consideration is how many students are attending the school, and whether enrollment is increasing. For example, the University of Illinois at Chicago (UIC) experiences high enrollment and enrollment growth. In fact, UIC’s enrollment was 31,683 in the fall of 2018, up from 30,539 in fall 2017, representing an increase of 3.7%.3 More enrollment means more students, meaning more housing demand. Competition. The property you might be considering should be competitive with the new Class A asset down the street, as well as the Class B property that, while further from campus, has a shuttle service and terrific rent rates. Student housing assets can provide a diversification strategy for your portfolio4; and are, for the most part, recession insulated. Before spending money, however, it’s important to understand the dynamics that drive demand for this particular sector. U.S. Census Bureau. Rental Vacancy Rate for the United States. Retrieved from FRED, Federal Reserve Bank of St. Louis. U.S. Census Bureau. “Postsecondary Enrollment Before, During, and Since the Great Recession.” April 2018. UIC Today. UIC continues record enrollment growth with 31,683 students. September 12, 2018. Diversification does not guarantee returns and does not protect against loss.